One of my favorite memories of attending The Rocky Mountain School of Botanical Studies several years ago, was our class trip to Desert Canyon Farm in Canon City, Colorado, an organic herbal farm run by Herbalists Tammi and Chris Hartung. It was such a wonderful experience to be there, learning Tammi’s herbal knowledge. I remember sitting on their porch one evening with the rest of the class, listening to Tammi talk about her experiences of living on the farm and her joy in doing this as her work. 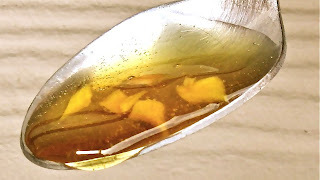 She then went inside the house, saying she wanted us to share in one of her favorite things and returned with one of the most delicious foods I had ever tasted ~ Medicinal Ginger Honey. She handed each of use a teaspoon and offered the jar of honey to us. Needless to say, we all loved it and were in heaven as we licked every last bit of it off of our spoons. Life is truly sweet! Warm the honey on very low heat for a few minutes to get it warm to the touch. If it is too hot to touch, lower the heat. Add the ginger and continue to heat for 15 minutes or so, just at a warm temperature. Pour the honey into a heat safe jar and label it with an 18 month expiration date. You can strain out the ginger, yet leaving it in makes the medicine stronger over time. And eating a few pieces of ginger in the honey adds another level of flavor and medicinal intensity. It will warm you right up! This medicine is wonderful for digestive and respiratory health. For those of you with asthma, honey and ginger are two of the most effective ingredients that you can use. Both honey and ginger help rid the respiratory system of mucus and ginger also helps stop inflammation. This is also great for warding off the common cold and flu. Additionally, it can be helpful for women in the first few months of pregnancy to decrease nausea. There is one warning though… you may have to restrain yourself from eating this all day long! I hope this warms your body and spirit. *Honey is not safe for babies younger than one. Also, eat a small amount before ingesting too much if you are aware of food sensitivities. This entry was posted in The Cornucopia and tagged Healing, Healthy Living, Herbalism, Herbs, Recipes. Bookmark the permalink.